Have you read the Mariner online? I say you shouldn't. I hate the fact that it is online now instead of being printed out. 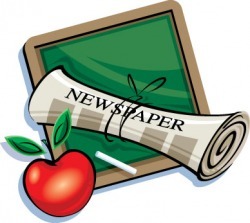 I have been in the newspaper class, and the online newspaper only gets updated once every four to five weeks. According to http://www.weathermichigan.com/advertise, 94% of kids ages twelve to seventeen use the internet on a regular basis. But if the newspaper is updated that slowly, I highly doubt that kids are looking at it when they're online. “No one in Mill Creek goes online to read it because we all have lives!” said Sam K, 7th grader. Students have also been known to be heard complaining about how boring it is. I've been told that there are too many sports articles, or just not interesting enough topics to write about. “...nobody has topics to write about in boring Dexter, Michigan.” said Maddie J, 8th. Internet access isn't always fast, or sometimes there's not good service. In this case, it takes so long to view articles that it's almost pointless to even try to read them. “The fact that the Mariner isn't printed out anymore makes me mad!” said Zach H, 8th grade student. When there was a paper copy, students would walk around carrying the Mariner. This was a constant reminder to them to read the newspaper. “What's wrong with the regular paper?” said Sierra L, 8th grader. “I don't see why it's not still printed out.” Every person that was interviewed said they didn't like it. I don't like the online newspaper, and you can help me protest it by convincing everyone you know to not go online and read it. Should the Mill Creek Mariner be published online? Click here to enter your vote!